Thousands of animal species are threatened by anthropogenic climate change. Here is a small sample. 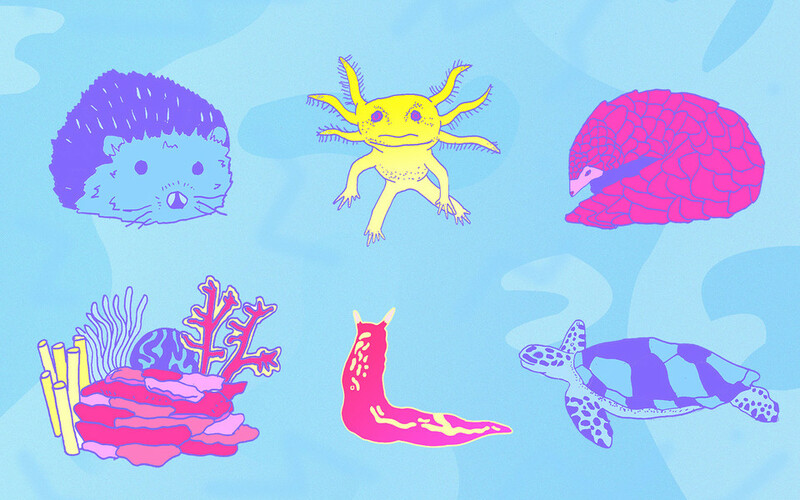 Axolotls are those enchanting salamanders, limb-growers, Bowie-esque in style and, now, frequency. Bicknell’s thrush with confetti of stars on breast, insect quests no longer synchronised. Coral (staghorn), crystalline dendrites of the deep, food for many before warming and mass bleach. Dragonfly called splendid cruiser soars above rivers, mint green eyes seeing unimaginable colours. Edith’s checkerspot butterfly has cracked toffee wings, soon to be consigned to books. Fin whales are majestic and massive. They gulp krill with a suspendable, pelican-like throat. Golden toad, an amphibian made of glowing yolk, is already gone; loads of toads are fucked. Hedgehogs: I saw one once, maybe ten years ago, and it was amazing. Irrawady dolphin’s adorable snub-face won’t prevent eviction from its freshwater home. Kapatur pink slug is cute and long; a neon pencil sliver on threatened mountaintops. Leatherback turtle nests are washed away by rising seas like cars swept down flooded streets. Mountain gorillas, our close living relatives, already few, could vanish through climate-driven disease. Northern bald ibis, revered for oil-slick plumage by ancient Pharaohs now turning in their sarcophagi. Orange-spotted file fish is not just a pretty thing; it camouflages with smell to escape predators. Pangolins, or Trengilling, climb trees like a Slinky going backwards, looking for ants. Quetzals are so resplendent, like Christmas kites, they make my heart race (look them up). Ringed seals have no ears and no ice; as it melts, the outlook is bleak. Sea horses, but really, sea everything as it toxifies. Tigers’ (just a few thousand) faces burning bright, their habitats lit by forest fires. Uakari’s face is so red – why? A barometer of health and sexual arousal, uniquely evolved. Voles glide into decline, sweet riverbank-dwellers, fat and shy. Whooping cranes, snowy white with crimson heads, are tall and prehistoric-looking, still, despite droughts. Xanthomyza phrygia (regent honeyeater) mimics calls if alone; its markings cast couture as hessian. Yellow-eyed penguins roam scrubs in Batman-style eye masks desperate to find food. Zebra sharks comb the carpet of the sea for crunchy molluscs, so not far to fall. Lucy Jones is the author of Foxes Unearthed: A Story of Love and Loathing in Britain to be published by Elliott & Thompson in April 2016.